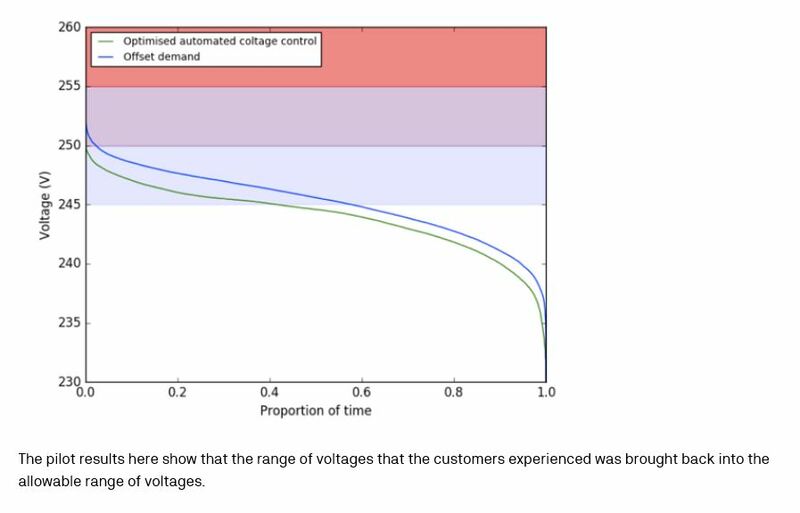 There is an emerging perception that solar PV is troublesome for the performance of Australian electricity networks by potentially increasing voltage variability. 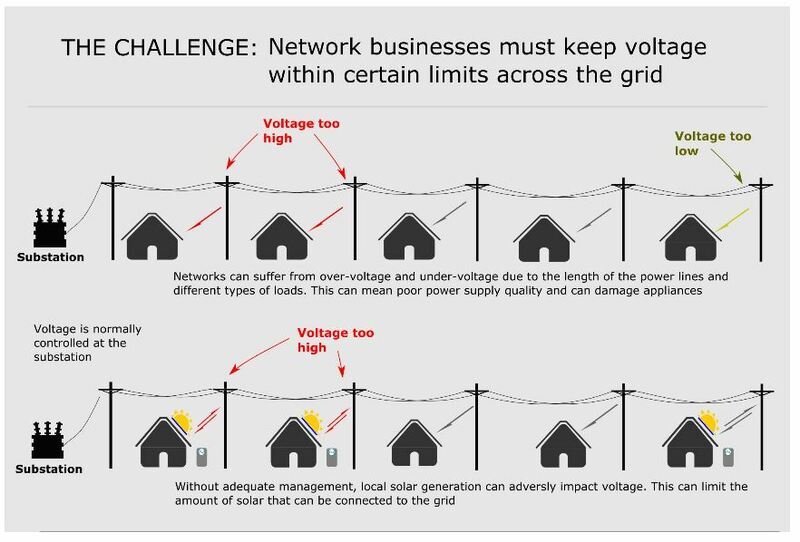 The Networks Renewed trial aims to address that perception by clearly demonstrating how solar PV and batteries can instead be a valuable resource for the businesses who manage electricity networks; changing the problem into a solution. We are pleased to be releasing the pilot results from both our NSW and Victorian trials. Over the past 12 months, we have run a pilot program in Collombatti NSW, trialling how smart solar PV and battery systems can be used to help networks manage the quality of electricity supply on the energy grid. 25 trial systems that have now been installed in Collombatti. These systems make up a virtual power station, which can respond to times of low and high voltages by generating and storing electricity. Our NSW network partner, Essential Energy is able to place bids for network support with the participants in the virtual power station. Some early test results are in! For two tests conducted in late September where Essential Energy placed a bid for support, the virtual power station was able to generate over 50kW of electricity, improving local voltage by 1.73%. 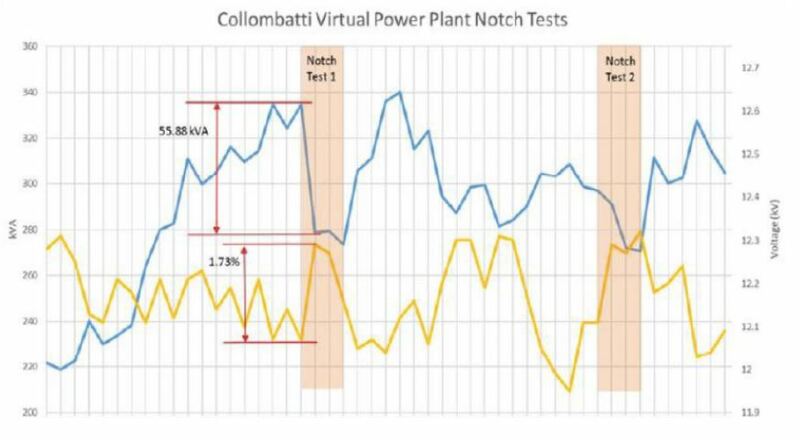 Our total target voltage for the trial program is 5.5%, which we will work towards as we extend the virtual power plant into the market scale trial. The chart below shows how the tests played out. In an area of south east Victoria covered by United Energy’s network, the trials have focused on control algorithms that automatically dispatch generation and storage to improve local voltage. The primary problem for customers in this area is high voltage, so the systems need to work to bring the volts back down to an appropriate range. The trialled strategies aim to maximise the potential of solar power in the region, to intelligently sense what the voltage is in the nearby network and to directly respond to current voltage levels with both real and reactive power generation. The next step for the program is to expand the trials to a market scale, where there are more participants in the virtual power plant and a greater ability to assess what the economic value is of this new service that electricity grid operators can use. ISF will be expanding the trial in NSW and adding a new area in the Victorian trial for the next stage. Read more about the Networks Renewed project below. The Australian Renewable Energy Agency (ARENA) is providing $1.87 million in funding for the Institute for Sustainable Futures (ISF) at the University of Technology Sydney to lead the trial, dubbed Networks Renewed. Networks Renewed will pioneer an innovative use of mass distributed solar and storage in Australia. The project will build on the knowledge generated from smaller trials to bring the idea of a truly smart electricity grid closer to a reality. To achieve its goals, the project will tap into brand new, ‘smart’ inverter technologies – the devices that connect solar and batteries to the network. Smart inverters have the capability to control PV panels and storage in a much better way, offering a suite of new business opportunities. The project will comprehensively examine the technical alternatives for providing network support using smart inverters, and the value propositions that will make them attractive to businesses. ISF is partnering in the trial with electricity network businesses – Essential Energy in New South Wales (NSW) and United Energy in Victoria – storage software start-up Reposit Power, solar technology provider SMA Australia, the Australian Photovoltaic Institute, and the NSW and Victorian Governments. 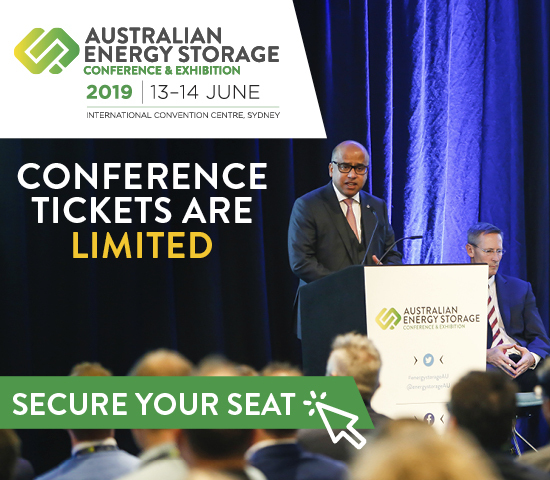 Industry partners will build practical, market-scale demonstrations in both NSW and Victoria to show that smart inverter technologies are a viable commercial option for providing network support services. The demonstrations will be large enough to achieve meaningful improvements to power quality, and generate sufficient market revenues to develop a strong business case for future projects. More than 150 electricity customers in NSW and Victoria will be recruited to the trial. If successful, the trial will not only demonstrate how solar and battery storage can help support reliable networks, but also accelerate uptake of rooftop solar. 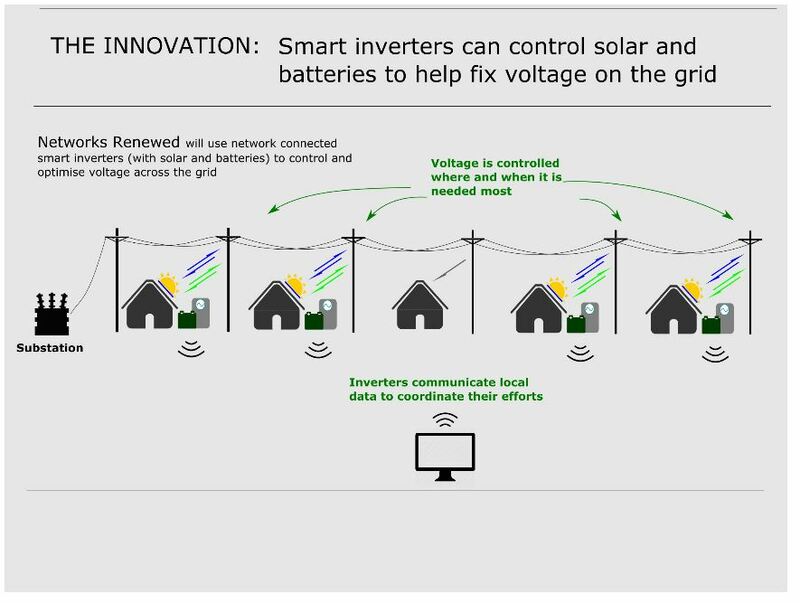 Below is an infographic, demonstrating how the smart inverter technology operates. The benefits of Networks Renewed are derived from the industry-led approach to demonstration and investigation. The key outcome of the Project will be a practical understanding of the commercial value of new smart inverter technology. If the project is successful, all Australian network businesses will have a workable precedent for using smart inverters for network support services themselves, or contracting third parties to provide these services independently. The broader benefit to Australia will be the greater opportunities for distributed generation, such as residential solar, to increase the proportion of renewable energy on the national grid. This will help realise Australia’s joint goals of clean, affordable and reliable electricity generation. ARENA CEO Ivor Frischknecht said the Networks Renewed project would help inform Australia’s electricity future and show how small-scale renewable energy can provide value for both network businesses and households. This project is supported by ARENA’s Advancing Renewables Programme.